There are two spinners. 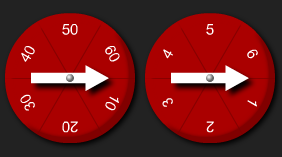 The first spinner shows 10s and the second spinner shows 1s. When you spin the two spinners, the numbers can be combined. For example, if the spinners land on 20 and 4, I can combine these numbers to make 24. What two-digit numbers can you make? What numbers can’t you make? There some interactive spinners here that you can use for this problem. Generalising. Combinations. Working systematically. Investigations. Addition & subtraction. Visualising. Recording mathematics. Interactivities. Practical Activity. Place value.